Erin Kennedy Clancy is part of Sullivan Hill’s Construction, Insurance, Real Estate, and Commercial and Business Litigation practice groups. She has substantial experience in representing businesses and individuals in complex multimillion dollar residential and commercial construction defect claims, property damage and contract claims throughout California. Ms. Clancy’s practice includes the representation of owners and general contractors in all aspects of private and public works construction including contract review, drafting and negotiation, mechanic’s liens, alternative dispute resolution, administrative proceedings and litigation, and in insurance coverage litigation matters. Through Ms. Clancy’s ability to counsel clients and represent her client’s interests in relation to compliance, business transactions advice, insurance coverage and dispute and litigation in the environmental law field, she is able to help clients navigate through the ever-changing environmental requirements that impact their operations. Specifically, Ms. Clancy provides a range of services with regard to green building and sustainability, including litigation and arbitration arising from green building projects, green construction contracts, regulatory requirements of sustainable development projects, LEED and SITES certification, risk management of green development projects, local, state and national laws, tax incentive programs and local, regional, national and international trends. 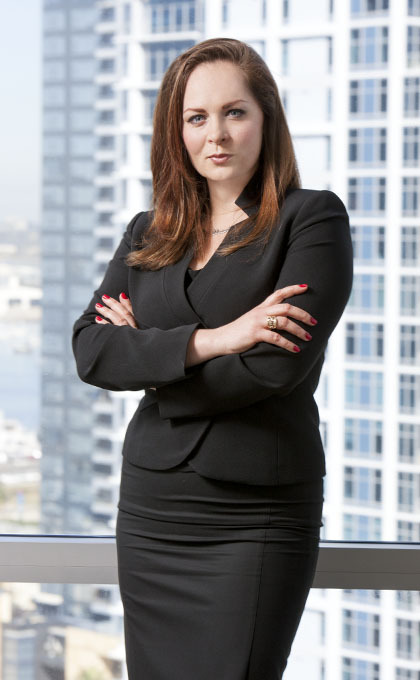 Ms. Clancy was named a 2018 and 2019 Rising Star by Super Lawyers, and has been recognized in San Diego Metropolitan Magazine’s 19th Annual “40 Under 40” award for 2018. She was also nominated from 2011-2013 as one of San Diego’s Outstanding Young Attorneys, by The Daily Transcript. Ms. Clancy has worked with clients ranging from Fortune 500 companies to board members of non-profit corporations to sole proprietors to individuals. Her life experiences in studying five languages, living in two continents and traveling extensively within Australia, Europe, the United States and Antarctica serve to provide her clients with a worldly perspective and balance. Weiss v. Trans West Housing, Inc., et al. : Argued successfully before the Fourth Appellate District of California after obtaining a judgment, based on lack of standing, against the plaintiffs three months prior to trial and after appearing as the third defense counsel in the case. Costs were awarded to the client after the litigation had been active for almost five years. Ms. Clancy was admitted to the State Bar of California in 2007. Additionally, she is admitted to practice before all courts of the State of California and the United States District Court for the Southern District of California. Ms. Clancy is a member of the following associations: San Diego County Bar Association (member of the Civil Litigation, Construction Law, Business & Corporate Law, Insurance/Bad Faith Law Sections and Animal Law Section); San Diego Green Building Council; Tom Homann LGBT Law Association; and the University Club. She is also a volunteer with SoCal Bulldog Rescue and the Animal Legal Defense Fund.